The King Edward Rink was the first structure open to skating and curling in Stroud. It was built by Mr. John Robertson on the land known as Sunnybrae Ave. The rink was 180’ by 44’ with a walkway of 4’ and a platform of 20’. Six gasoline lights worked effectively to spread light to the entire ice surface. The building cost was $3000. It officially opened on January 1,1910 to a crowd of well over 200 people. The Stroud Curling Club was organized in 1910 with E.T. McConkey as the President. There were 15 charter members and each curler had to provide their own stones. These stones varied in weight from 44 to 60 pounds. Stroud became a registered member of the Ontario Curling Association in 1911. 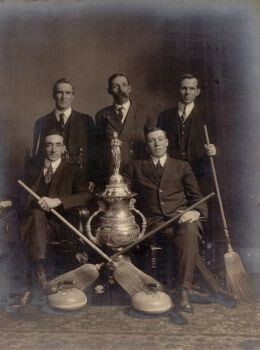 In 1916 a Stroud team won the Sleeman Trophy, a 250 lb. 52 inch tall silver trophy valued at $1200. For a year the trophy was kept at the home of Hilliard Meredith. When the donor of the trophy died the trophy was called in and melted down and the money went to the Sleeman estate. A photo of the winning team features: Lou Guest (lead) R.A. Sutherland (driver) O.R. Black(second), Hilliard Meredith (vice) and Selvin Meredith (skip). A generator drove a gasoline engine to provide electric lighting to the rink in 1921 and when the hydro came to Stroud in 1928 it was installed at the rink. 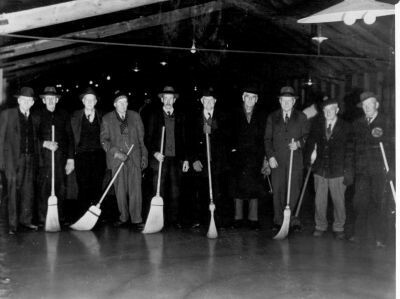 In 1936 the rink was bought by five curlers who widened it by 10 feet and enlarged the waiting room. In 1944 the rink was sold to Wilbert Black who put in a huge cistern to help with the flooding. Unfortunately in 1946 many felt the building was unsafe and in 1949 it was sold to a prefab housing company and then sold again to Mr. Findlay Munroe for storage purposes. Between the years of 1946 to 1964 curlers went to Churchill and Barrie to curl but in 1964 the Stroud Community Centre was opened and the Stroud Curling Club reorganized under the leadership of President John Cowan. 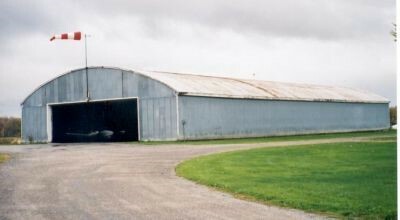 This building served the Stroud community until 1975 when it was dismantled and rebuilt as an airport hangar for the Orillia Airport. Many of our curlers got their start on this natural ice. A grader blade 2 to 3 feet in width was used to scrape the ice and Bert Mulholland created a sprinkler, a polisher and several measuring devices. Preparation for the curling ice could not begin until hockey and skating times were over on Monday night. Fifty-four curling stones were purchased from the Midland Curling Club for $200. The weather combined with the steel roof played havoc with the curling ice and in February 1966 curlers moved to finish their season to the Churchill and Cookstown rinks to complete curling playoffs. In 1969 fund raising started to get the equipment necessary for artificial ice. By October 1970 artificial ice equipment was installed and operational. By this time a large number of curlers were curling with the Stroud Curling Club out of Cookstown. The ice was rented and used by Stroud curlers on Tuesday and Friday evenings. The Stroud Curling Club was incorporated in February 1974 and the directors started planning and fund raising to have a designated curling club in Stroud. A great deal of thought and discussion took place in order to finalize the design of the Stroud Curling Club which was to become part of the Stroud-Innisfil Recreation Centre & Library. When the Club agreed to pay $180,000 towards the complex and agreed to pay for its share of the operating costs of the complex it was agreed that they would be part of the new building. Hundreds of hours of fund raising went in to raise the money for the building. There were monthly dances, golf tournaments, fruit and cheese sales, and large galas. A large portion of the money came from personal loans secured by some of the members and arranged with the Innisfil Farmers’ Credit Union. 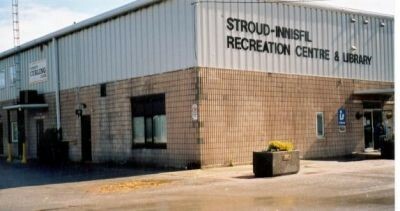 With a great deal of pride and satisfaction the Stroud Curling Club officially open on January 5, 1976. Since that time there have been ongoing improvements and changes to the Club with lockers, display cabinets, wall units, a bar, and upgrades to the kitchen. Our curling stones have had continuous upgrading as well. When the Thornton Curling Club was destroyed by fire additional curling stones were purchased for $400. These stones along with others acquired from Sundridge were all repaired and reconditioned. In 1978 the rocks were expertly recut using a grinding machine and then hand polished. In 1986 the rocks were sent to Thompkins-Heels for polishing and in 2009-2010 fund raising started to buy new rocks. First individual rock handles were sold and a loan was taken out for the club to buy new rocks. In November 2011 new rocks for all five sheets were installed and the new handles transferred onto to them. The Clif Thompson Senior League curlers were the first to use them and the first rock in league play was delivered by Jim Oulahen. The historical information recapped here can be found in more detail in the book, "The History of the Stroud Curling Club 1910-2003" researched, written and edited by Donna Wice, Nancy Flood and Randy Flegel.